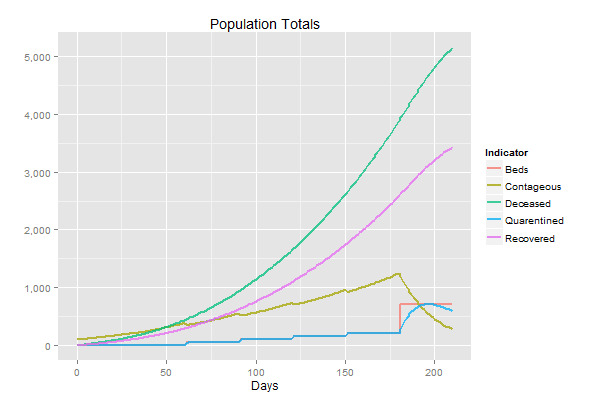 A month ago when the WHO was projecting estimates of the effect of current outbreak of Ebola being as deadly as affecting 20,000 people, I ran some elementary modelling and found that these estimates are far too small given the current trend. The motivation for the post was to raise awareness that situation could get far worse than anybody was talking about at the time. Since then, most of my 'back of the envelope' estimates have ended up being disturbingly close to reports the World Health Organization has been releasing. Which frankly is extremely scary. Currently I am living in Mozambique in Southern Africa and though Mozambique is slightly more developed than Liberia, I have no reason to believe that things would be any different here than in Western Africa if an outbreak went undetected for a month as it did in Western Africa. This among other things has made me wonder how inevitable such an outcome is. Should everybody who can leave Africa and find a nice little bunker to hide in until this whole thing passes? Well probably not but only if Ebola can be stopped. Currently the world seems to be responding to the crisis in the countries affect in three major ways: 1. provide beds, 2. provide laboratory capabilities to diagnose Ebola, and 3. provide advertisements to increase awareness. But how can we know how effective these measures can be against such a seemly unstoppable force? Time to break out our models! Unfortunately there is no really easy way to model this. 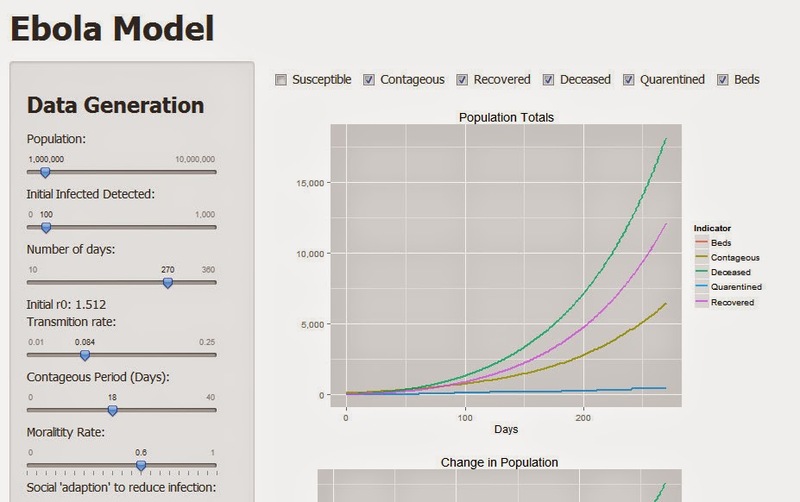 However, modifying the standard epidemiological SIR (susceptible, infected, recovered) model I am able create a model which looks to be functioning the way we would like it to by including some additional parameters. To see details of the model's construction, see the technical appendix. The primary new parameters of consideration are 'beds' which represent the number of beds available as well as the food and supplies necessary in order to feed people who are residents of these beds. Infected individuals once detected are transferred to quarantine if beds are available. If they are not available then infected individuals remain contagious until they recover or die. From a paper by Fisman, Khoo, and Tuite I have incorporated the idea of social adaption to the epidemic. This captures the concept that the infection could be naturally controlled to some extent by changes in the behavior of the susceptible population and that of the contagious population. It becomes immediately clear that the model is extremely sensitive to just about every parameter included. If the infection rate is too high then everybody gets sick. If the rate is too low then the epidemic is quickly contained. However, for this exercise let us assume we cannot directly control in any way infection rates but we can choose how many beds, how effective we are at detecting new cases, and we have some influence on how people respond over time to Ebola by taking safety precautions such as not touching the sick or dying. Each of these interventions can have a significant effect on the outbreak. These interventions when looked at carefully turn into two different strategies: 1. Quarantine infected by providing beds and provisions and 2. increasing public awareness to reduce probability of spread over time. The effect of a significant investment in beds (500 new beds) after seven months can abruptly turn around the spread of Ebola as the contagious population is rapidly shifted from free and dangerous to safely quarantined (assuming an effective mechanism exists for detecting those who are ill). Figure 2: Base model after seven month beds intervention. I have not including behavior curbing into the model quite as dramatically. Instead I have specified social behavior changes as a cumulative effect over time. In the base model individuals adapt to the disease by being .03% less likely each day to contract the disease. This is not much though it does accumulate significantly over time. After six months of the epidemic individuals would be about 5% less likely to get Ebola when exposed to an individual with Ebola. 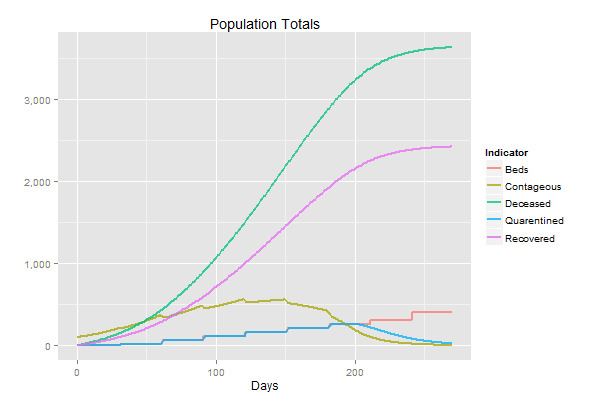 If we are able to increase awareness about prevention of contraction of the disease to say .06% increase per day then individuals are about 10% less likely to contract Ebola after six months. 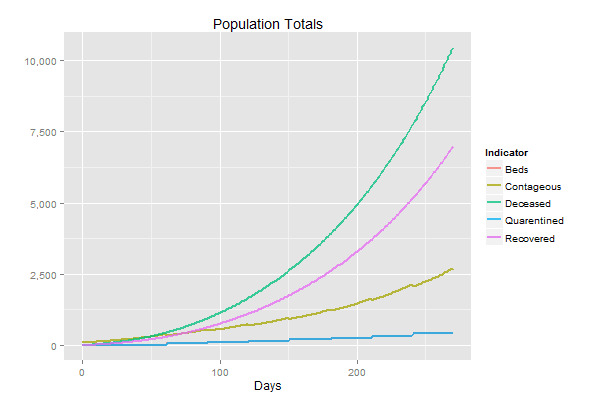 Though these numbers are not large the effect can be profound on our model. Figure 3: Behavioral adaption can dramatically reduce the lifespan of the outbreak. However, the significant problem with including social adaption in this way is that this is based on accumulated actions over time. If this is the case then Ebola should already but or its way out. As mentioned previously this model is extremely sensitive to parameter choices. It is therefore more of an illustrative tool than actually meant to exactly represent the situation in Western Africa. As a tool we can see under the right circumstances that beds and public information can have a dramatic effect on the spread of Ebola. However, don't take my word for it! Check out the app below and play around with the model yourself. delta is transition rate to recovery or death. Very impressive and informative article. Keep going on.